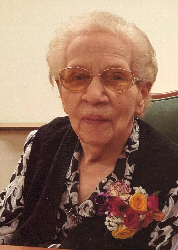 Obituary for Florence (Dubuc) Tourigny | Boucher Funeral Home, Inc.
Florence (Dubuc) Tourigny, 102, of Templeton, formerly of Gardner, died peacefully Wednesday, August 22, 2018 in Alliance Health at Baldwinville, surrounded by her family. Florence was born in Waterloo, Ontario, Canada on December 4, 1915, the daughter of the late Philias and Rosina (Ares) Dubuc. She was a member of Annunciation Parish/Our Lady of the Holy Rosary Church of Gardner, and its Ladies of St. Anne Society. A devoted wife and mother, Florence spent her life as a homemaker caring for her family. Florence enjoyed playing cards, walking, and watching the news on television. She also liked spending time at the Hinsdale Greyhound Park in Hinsdale, NH watching the greyhound races. Florence was predeceased by her husband of 65 years, Herve H. Tourigny, who died in 2003. She leaves two sons, Clement G. Tourigny and his wife Evelyn of Gardner, and Claude P. Tourigny and his wife Rosemarie of Estero, FL; one daughter, Diane T. Brideau and her husband Donald of Gardner; seven grandchildren, thirteen great-grandchildren; several nieces, nephews and cousins. Florence was predeceased by two brothers, Florent Dubuc and Barney Dubuc; and two sisters, Virginia Oldham and Therese Miller. Funeral Services will be held Saturday, August 25th from the Boucher Funeral Home, Inc., 110 Nichols Street, Gardner with a Mass at 11:00 a.m. in Annunciation Parish/Our Lady of the Holy Rosary Church, 135 Nichols Street, Gardner. Burial will be in Notre Dame Cemetery, West Street, Gardner. A calling hour will be held Saturday, August 25th from 9:30 a.m. – 10:30 a.m. in the funeral home. Memorial contributions may be made to Alliance Health at Baldwinville, Activity Fund, 51 Hospital Road, Baldwinville, MA 01436. Please reference in memory of Florence Tourigny.